CRASH and BURN is the well-known acronym for the diagnosis of this disease. It is an acute body wide vasculitis of the small and medium-sized arteries that mostly affects those younger than five years of age and is the most well-known etiology of coronary disease in children.1 Often termed mucocutaneous lymph node syndrome, but better known as Kawasaki Disease. The cause of Kawasaki disease, even though founded in 1967, is still unknown. It is thought that an excessive immune response to a pathogen in the patient’s body leads to abnormal production of inflammatory cytokines, which cause endothelial damage. The incidence of hospital admissions due to Kawasaki disease has not fluctuated much over time, occurring in around 19 per 100,000 children under five years of age per year. The peak time of the year that Kawasaki disease presents has been seen to be from January to March. Asians and African American have been found to be 2.5 and 1.5 times more likely to be affected by this disease. An easy way to keep these criteria in your mind is the acronym CRASH and BURN. BURN: Fever for 5 days duration. Other symptoms including vomiting, diarrhea, abdominal pain, cough, joint pain, and runny nose can occur in Kawasaki disease as well. Overall, Kawasaki disease is a clinical diagnosis. No imaging or laboratory test will give us the answer directly. However, some laboratory values and diagnostic studies can be helpful in the diagnosis. 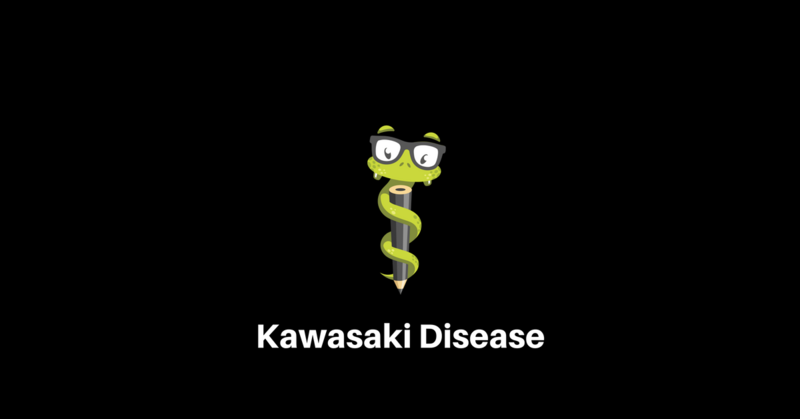 Classical Kawasaki disease is diagnosed when a patient has four out of five of the classic CRASH features along with a fever for five or more days (BURN). If a patient does not have four out of five of the diagnostic features, they can still be diagnosed with Kawasaki disease if a fever is present for five days, along with two or three of the classic clinical features, and coronary artery aneurysms seen on echocardiography. In those patients who do not meet the criteria for Kawasaki disease, they may have incomplete or atypical Kawasaki disease. This is more frequent in younger infants as well as older children but should be thought of when a patient has a fever for over five days with only two or three of the classic features. IVIG (intravenous immunoglobulin) and high dose aspirin have been the go-to medications for treatment of Kawasaki disease. Additionally, corticosteroids have been studied along with IVIG in the treatment of this disease. Research has shown that IVIG with steroids reduce the risk of coronary artery complications more so than IVIG solo therapy. The dosing of IVIG should be 2g per kg and should be given within ten days of the onset of symptoms. This can be given outside of 10 days of onset if there is a persistent fever, signs of inflammation, or presence of coronary aneurysms. High dose aspirin is used to reduce inflammation as well as to minimize thrombosis. However, it does not reduce the rate of formation of coronary aneurysms. The AHA recommends using 80 to 100 mg/kg/d in Q.I.D. divided dosing until fever free for two to three days. After this point, low dose aspirin is recommended to be given, 3 to 5 mg/kg/d as a single dose for six to eight weeks after disease onset. If coronary aneurysms are present, then aspirin may need to be given lifelong. For patients whose symptoms are persistent with the initial therapy of IVIG, repeat treatment with IVIG can be completed. In addition, as mentioned above, corticosteroids, as well as TNF-alpha inhibitors such as infliximab, can be considered. Lastly, for treatment-resistant cases, plasma exchange can be used. Those with mild or moderate coronary aneurysms can be treated with aspirin alone or with an antiplatelet medication such as dipyridamole or clopidogrel. Heparin and warfarin are used in cases with larger coronary aneurysms. How should these patients be monitored long term for resolution, or even progression or advancement of coronary aneurysms? 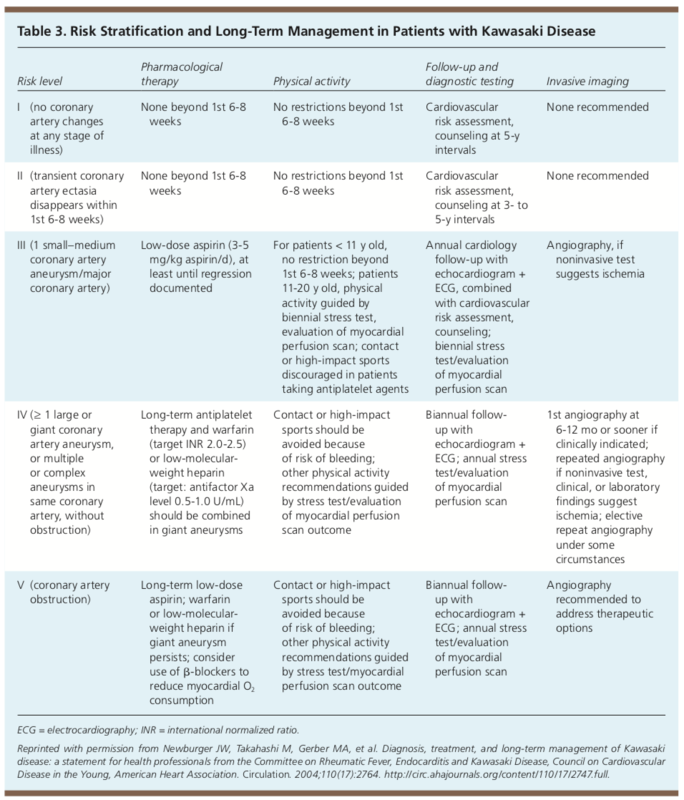 The AHA has given us guidelines on the long-term therapy, activity restrictions, and follow up imaging recommendations. Am Fam Physician. 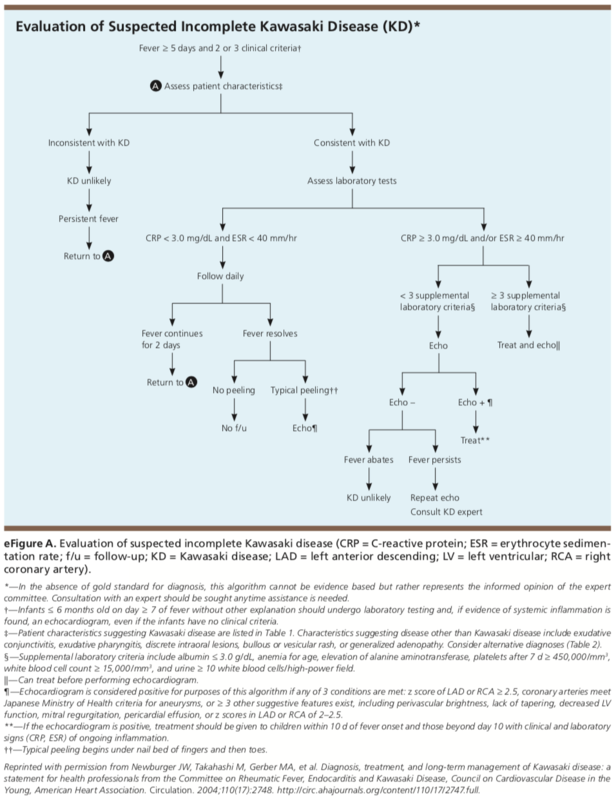 Diagnosis and Management of Kawasaki Disease. 2015 Mar 15;91(6):365-371. Am Fam Physician. Kawasaki Disease: Summary of the American Heart Association Guidelines. 2006 Oct 1;74(7):1141-1148. Ferri’s Clinical Advisor, Kawasaki Disease, 2017.